An Abuja-based lawyer and founder, Basic Rights Enlightenment Foundation, Augustine Ikechukwu, has asked the Police Service Commission to investigate the assault on him by some policemen attached to the Central Police Station, Aba, Abia State. 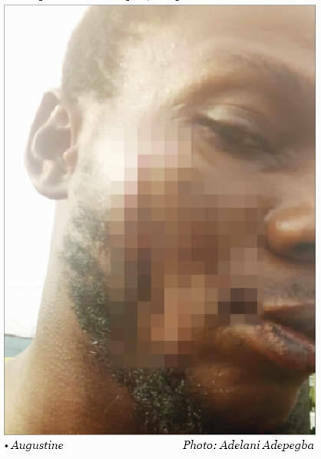 The human rights activist alleged that seven policemen stormed his elder brother’s house on Hospital Road, Aba, on September 20, 2018, hit him with gun butts and inflicted injuries on his face and body. The petition by Augustine’s lawyer, Ikechukwu Maduike, was dated November 23, 2018, and addressed to the Chairman, PSC, Musiliu Smith; the Inspector-General of Police, Ibrahim Idris. Maduike explained that the policemen attacked his client in anger because they could not find his brother, Samuel Okechukwu, who was accused by one Celestine Okeke of abetting his female worker to steal his goods. The petitioner stated that Okeke, who is the proprietor of Celestine Okeke & Sons Enterprise Limited, had in May this year reported to the Special Anti-Robbery Squad, Aba Command, Eziama, Aba, that one of his female workers absconded with some of his goods. He added that Okeke told the SARS operatives that Samuel, a key distributor/sales executive of Guinness Nigeria Plc attached to his company, had a good rapport with the fleeing worker and might be harbouring her. Maduike explained, “Since then, the SARS operatives, on the bidding of Okeke, formed the habit of incessantly arresting Samuel and extorting money from him. On August 7, Samuel went to court and obtained an order restraining the police from further arresting him. However, on September 20, Maduike stated that Okeke, in company with seven police officers, in a show of brute force and blatant disregard for the court order, allegedly stormed Samuel’s apartment around 5:25am. The petition read in part, “They banged ferociously on the door and our client opened the door for them and they asked after his brother and he told them that he had travelled, but before he could finish, they pushed him aside and began to search the house, turning everywhere upside down. Maduike said the cops who assaulted his client were Sergeant Lawson Eyang; Officer Akila; Inspector Emmanuel Ashilonu and one Ogbonna. The lawyer stated that his client was handcuffed, stripped naked and beaten like a common criminal before he was taken to the Central Police Station, Aba. He alleged that the Divisional Crime Officer at the police station, upon hearing about the incident, berated Okeke and the policemen for their action and directed that Augustine should be released to go home. “Thereafter, Okeke offered our client money to forget about the matter. When our client wouldn’t accept his offer, Okeke turned to the IPO to coerce our client to forego the matter,” he further alleged. But Okeke denied that the activist was assaulted, stressing that the police merely searched his brother’s apartment for allegedly conniving with his female worker to steal his goods estimated at N23m. He told The Punch that, “His brother connived with my sales girl to steal spirit and wines estimated at millions of naira; it is his business if someone beats him."